On Thursday, President Donald Trump signed a memorandum that authorizes the U.S. Trade Representative to determine what type of tariffs should be placed on China to handle the country’s unfair trade practices. The Trump administration could impose tariffs of 25 percent on $50 billion of Chinese exports and will be announcing which products would be subjected to tariffs in the next 15 days. Immediately following this announcement, several media outlets claimed that the “trade war” with China has officially begun. In response, the market fell, which is common with media pushing the “trade war” stories. On Thursday, the Dow fell 724 points, which is about 3%. But China will be given time to respond. So far, there have been mixed responses from Chinese officials regarding the memorandum. The embassy said the tariffs would have more of a negative impact on the American financial market, companies and consumers. “We urge the US to cease and desist, make cautious decisions, and avoid placing China-U.S. trade relations in danger with the purpose of hurting others that eventually end up hurting itself,” said the statement from the Chinese Embassy. The Trump Administration has said that it’s making trade policy a priority this year, especially pertaining to China. U.S. officials have continuously claimed that China is guilty of stealing U.S. intellectual property too. The administration had discussed introducing harsher penalties on Chinese imports, like aluminum, steel, and solar equipment for the last year in an effort to counteract the trade deficit. Then earlier in the month, Trump signed an order imposing a 25% tariff on steel products and 10% on aluminum goods. However, the EU, South Korea, Brazil, Australia, Argentina, Mexico and Canada are exempt from these tariffs. Treasury Secretary Steven Mnuchin defended this move by Trump to reduce the trade deficit with China. “We’re not afraid of a trade war, but that’s not our objective,” said Mnuchin. He suggested that this is all part of the U.S. negotiating tactics. In response to the steel tariffs, China’s Commerce Ministry gave reporters in Beijing a list of some of the U.S. goods that could be subjected to reciprocal tariffs. Could this really be the start of a trade war? Some experts argue that China doesn’t want a trade war with its best customer. Author’s note: It seems like it’s too soon to tell if this is really a “trade war.” It appears like this is all part of negotiating positions. 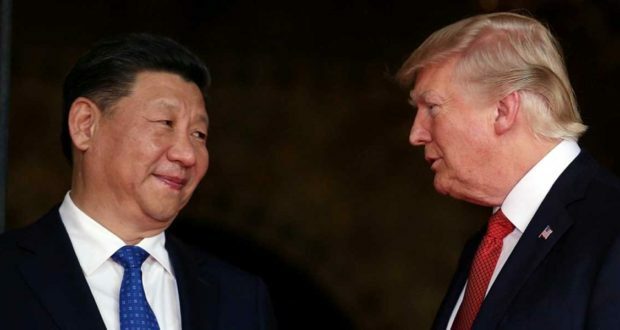 Hopefully, China recognizes how much they need the U.S. as a trade partner and a fairer agreement is put in place that gives more of an advantage to the U.S.
Editor’s note: The world had become used to the U.S. rolling over when negotiations came around. Trump’s tariffs are a surprise to China, and the world will be further surprised when their retaliation and blustering don’t work.